Just moments ago, AMD have officially announced a number of new Accelerated Processing Unit (APU) that are designed for notebooks and tablets. Previously codenamed as Richland, Temash and Kabini, all three of them were first discussed by AMD at CES 2013 earlier this year. 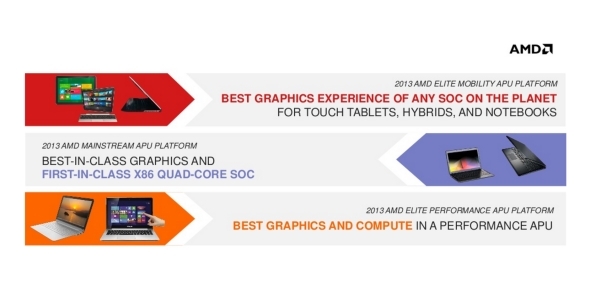 The three platforms – which are officially referred to as 2013 AMD Elite Performance, Elite Mobility and Mainstream APUs respectively – resulted in 15 new APU models under AMD A-Series and E-Series line-up. Each platforms are designed to bring computing and graphics performance to all form factors that existed in current mobile computing world including touch-enabled notebooks as well as tablets and hybrid notebooks. Since there are handful of them to go through, do check back later for our more in-depth look at AMD’s new mobile APUs for 2013.